Rock Creek Falls used to power a mill, and the ruins of the mill are scattered about the lower portion of the falls. 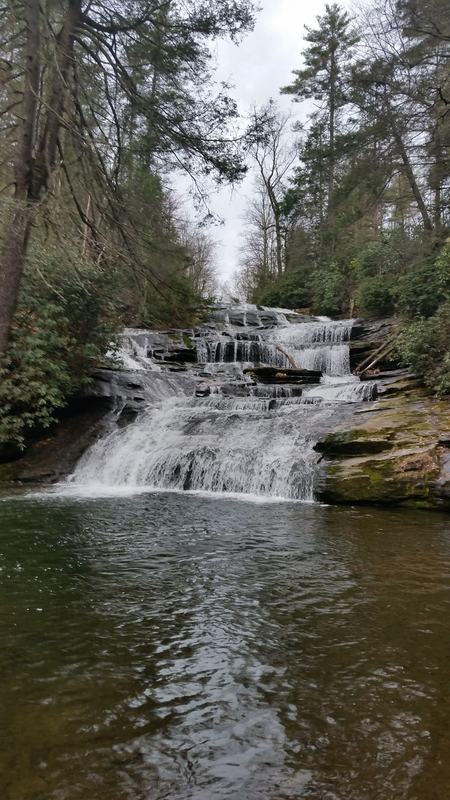 The falls are on private property and good views of the 150-foot cascade and the ruins are not available from the parking area. Howefer, there are no “No Trespassing” signs, and a short walk downstream gives excellent views. Directions: From Hendersonville, drive nine miles south on US 25 and take the Green River Road exit. Turn right and drive 2.7 miles to Rock Creek Road. Turn right again and drive .8 miles to a fork in the road. Take the left fork and park. The falls are to the right.